Greetings from the bench room! This week the Impractical Students have been practising cutting dovetails by hand, one of my favourite parts of our craft. The mood in here has been peaceful and focused... lovely. I've been having a great time working with such determined and enthusiastic students. We were delighted to welcome back our friend Lavi to the Upward Spiral program. He has begun work on a dovetailed cabinet in Pear wood, rough milling, selecting material, and practising dovetails in this very friendly but unforgiving wood. Refael has been making good progress on his Vidar's chair, completing his rear assembly on Friday. Chad is Composing a desk of European Sycamore in his final session here, based on JK's writing desk in Italian Walnut. The top will have a slight curve to it, as in the original, and he has laminated curved aprons to follow the shape. 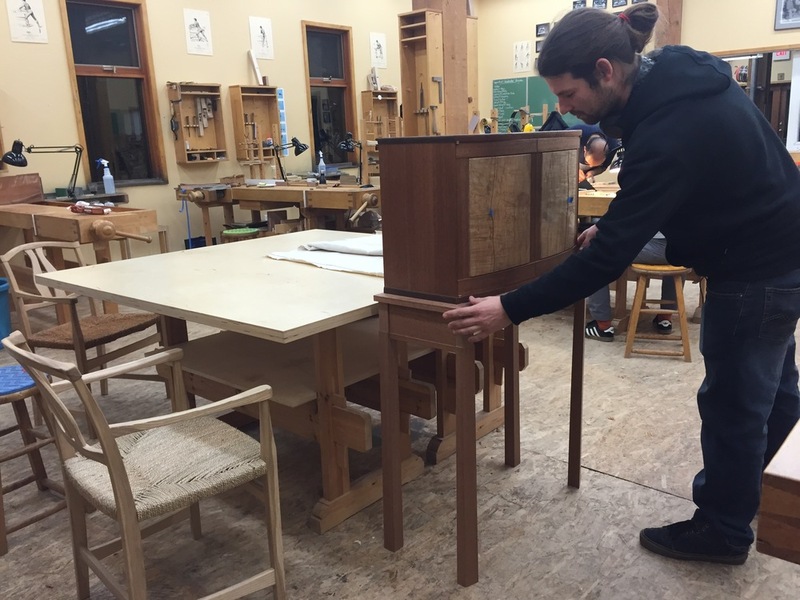 Our resident craftsman Spencer has been building a substantial cabinet in Sipo, Western Maple, and Spanish Cedar. This session he has been working hard on the stand, which features veneered aprons and dowel construction. This week he cut the tapers in the legs, and bevelled them in the front to match the curve of the cabinet. I finished up a small stand in Ash with twin mortise and tenons. It was quite a bit of work fitting these joints, and it reinforced what I already know - a good fit off the saw is critical. The final result I will share with you in my next post. I picked up again a tiny box I started months ago but left unfinished... The sides here are just about 4 millimetres thick - an offcut of my Boxwood cabinet - I remember it was quite challenging to cut such small joints! I ran the grooves for the bottom and sliding lid, dangerously close to the joinery, but it was all good in the end. Next week, perhaps, I will start on something new.